Reality Check: Could election improve UK’s Brexit position? The claim: The prime minister justified calling an early election on the basis that it would strengthen her position in the Brexit negotiations. Reality Check verdict: If she won, a larger majority would give her more flexibility to chart her own Brexit course at home and not having another election until 2022 would be advantageous. But it wouldn't necessarily strengthen her hand in negotiations with the rest of the EU. Theresa May told BBC Radio 4's Today programme that she had called the snap election because she believed it would put her in a stronger position as she starts to negotiate the UK's exit from the EU. Would she be in a stronger position domestically? If she won, a bigger majority would reduce the chances of a rebellion, either from Remain supporters or from those who advocate a more hardline Brexit. Of course, if the new Parliament has a greater number of ardent Remain supporters or she has a smaller majority or loses, that would be a different matter. Would a bigger majority in the UK Parliament strengthen her hand with the EU? It certainly wouldn't weaken it, but winning an election doesn't automatically give you more leverage in negotiations with the EU. Consider the case of Alexis Tsipras in Greece, who swept to power promising to end austerity and renegotiate Greece's bailout programme. He couldn't deliver because the rest of the EU refused to change course. EU negotiators would actually welcome a UK government with a larger majority because they believe it would make negotiations more secure and be the best guarantee of avoiding last-minute complications. But the biggest impact of an early election could be on what happens after March 2019, when the UK is scheduled to leave the EU. 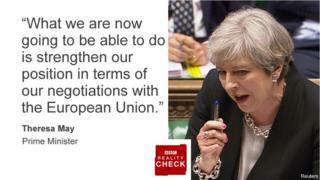 The prime minister told the Today programme: "If you look at the timetable, had the election been in 2020 we would have been coming up to the most crucial part of the negotiations - in what would have started to be the run-up to a general election." In other words, an election in 2020 would take place during a transition period (the government prefers the term "implementation phase") at a time when we could - in effect - be half in and half out of the EU, during a transition period. Delaying the election means there would be less political pressure during that transition - when the UK would have to make compromises on issues such as free movement of people, budget payments and the role of the European Court of Justice. To put it another way, holding an election now, and then another in June 2022, means in theory that a prime minister would have two years of Article 50 negotiations and then another three years of transition arrangements before they would have to go back to the country to let voters give their verdict on whether they had done a good job. Reality Check: Are lower earners bearing the tax burden?